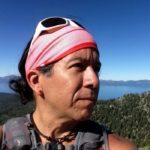 I am always proud to say that potatoes are from Peru, and that quinoa was once called the “Mother grain” by the Incas who first cultivated it in the Andes mountains. But did you know that the Incas also grew tomatoes in the Andes? Perhaps for that reason I enjoy making dishes like gazpacho soup in the summertime. But regardless of how you enjoy your tomatoes, it’s important to know where they came from and who farmed them. 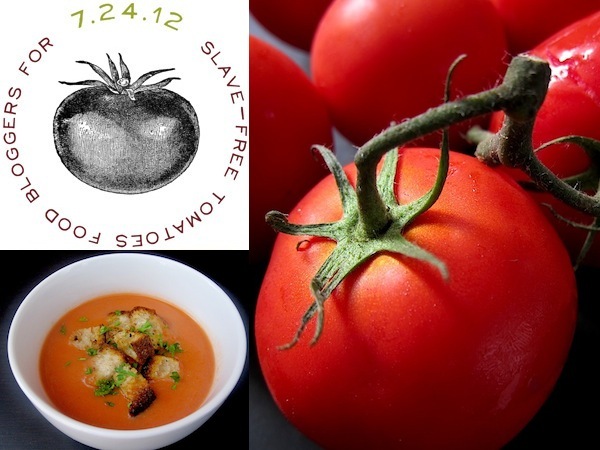 Get your produce from grocery stores or markets that carry slave-free tomatoes. In San Francisco, markets I support include Bi-Rite Market, Whole Foods, and the CUESA Farmers Market. I promise you that a cool gazpacho soup never tasted so good knowing that the people who farmed the tomatoes you used were not slaves. In addition to the ingredients above, you’ll need a bowl and an immersion blender for the soup and a skillet for the croutons. Remove tomatoes from the vine and cut into chunks. Mince the garlic, and measure the olive oil and vinegar. Slice 3 pieces of the country bread, cut into small pieces, and soak in cold water for a few minutes. Combine the tomatoes, 2 minced cloves of garlic, vinegar, and soaked bread in a bowl. Pureé using an immersion blender. Add olive oil a few drops at a time while using the immersion blender. Cover the bowl and refrigerate until chilled, at least a couple of hours. To make the croutons, slice another piece of bread, cut into small squares, and toast with 1 clove of minced garlic and olive oil in a skillet over medium heat. Serve soup in individual bowls and garnish with croutons and minced parsley.